I have a finish to show today! Yay! It seems like it’s been a long time since I had a finish to show on my blog. I did have that wall hanging in December I guess but that was a small project. 🙂 Anyway, here it is. This is not entirely a 2014 finish because it was started in 2013. I wrote about it in this post back in July. It’s the “Swell” quilt from Camille Roskelley’s “Simply Retro” book and I made it as part of a quilt along. 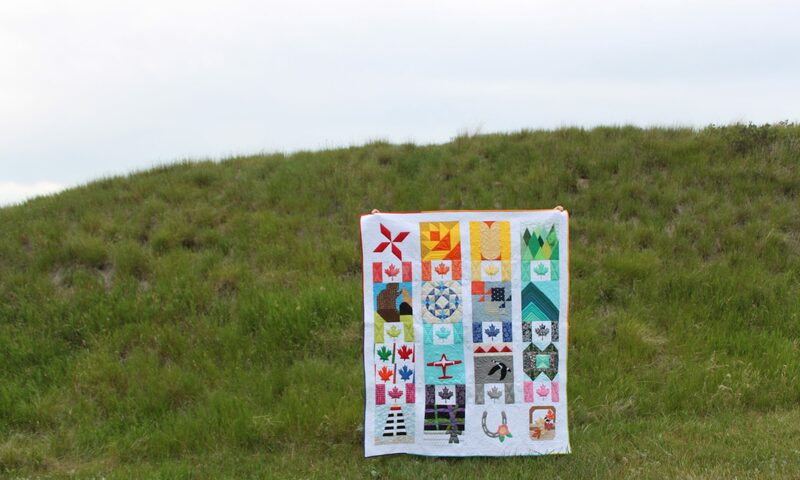 I was undecided about borders and then we had to get all packed up and move 200 km down the road to a new town with my husband’s work transfer so this little quilt has been stuck in a drawer ever since I got my sewing studio unpacked. The backing fabric is a grey polka dot and I have no idea who designed or produced it as there is no information on the selvage. I got it for $1.00 a metre at a church fundraising sale to benefit Grandmothers in Africa last spring. It was wide enough that I didn’t have to piece it. I also do not know information on the biding fabric which is a tone on tone calico. I’ve had the white background fabric and the red binding fabric in my stash for about 13 years! I bought them when “Crafts Canada” was closing out and originally meant to sew a red and white quilt with them.